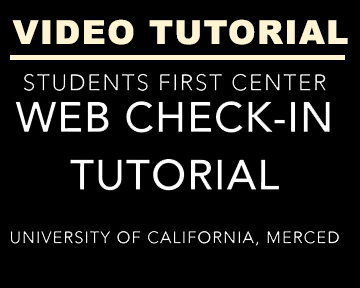 Please take a moment and watch our one minute video tutorial on how to use our Web Check-In system. You may also download the PDF version. Don't miss our FAQs below for more information on the Web Check-In system. 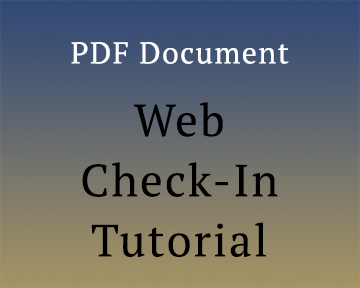 QUESTION: What is Web Check-In? Web check-in is a virtual check-in system that was designed to help you better plan your day. The check-in tool allows you to sign up for assistance, at the SFC, prior to stopping by. You will no longer stand in a physical line, you can check-in remotely and will only come to the SFC when it is your turn. QUESTION: Why do we need it? The web check-in tool allows both staff and students to better plan their schedules. Staff can now prepare for your arrival, knowing your question and who you are, allows us to begin research and get basic items completed. Students can take care of other items, such as getting lunch or studying instead of standing in line. The web check-in system provides a structured means for providing customer support and ultimately will create a better experience. QUESTION: May I skip using Web Check-In? No. As previously mentioned, this system will help us provide a better service to our customers. QUESTION: How else can I reach the Students First Center?